I want to say, I love watching food shows on TV. It’s a chance for someone like me, a self-taught cook to keep learning new things. All types of chefs throughout the U.S. are always coming up with innovated ways to take classic dishes and make them their own. I love to take what I lean from them and change it into something I can call my own. A couple of nights ago I was watching a show and I saw something I just had to make. Let me tell you about this recipe. 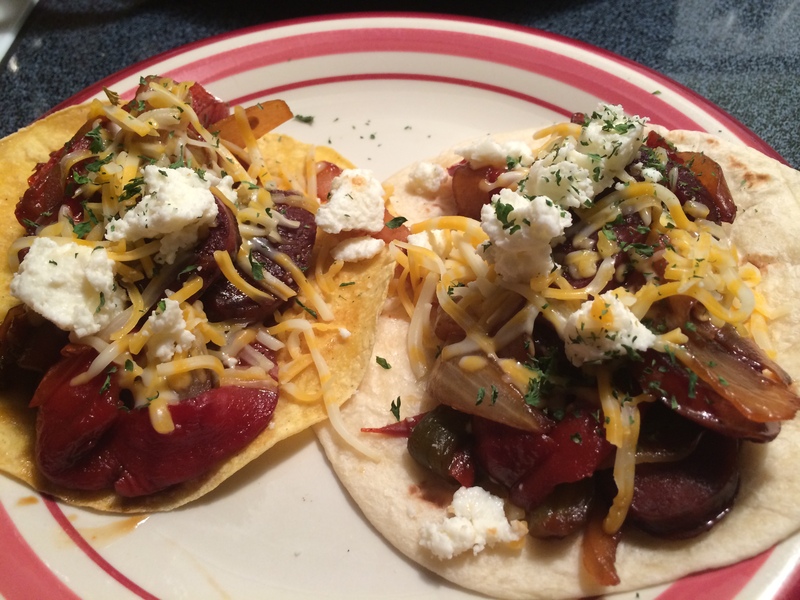 The star of this dish is Andouille sausage. 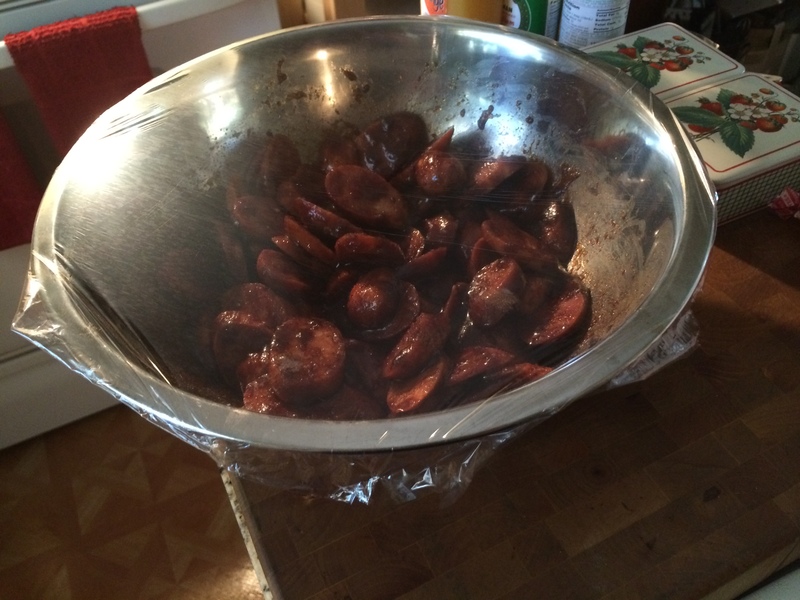 Now this type of sausage is widely used in New Orleans cooking. It’s so flavorful, but it has a kick to it. Jambalaya is a Cajun dish that most of us know and love and this is the sausage used in this dish. Now it can be hard to find but if you can find it, pick some up and try this recipe. Basically what I learned for this dish is to put a whole different spin on the taste of the sausage by marinating the sausage in some ingredients I would have never thought of doing. So let’s get started. 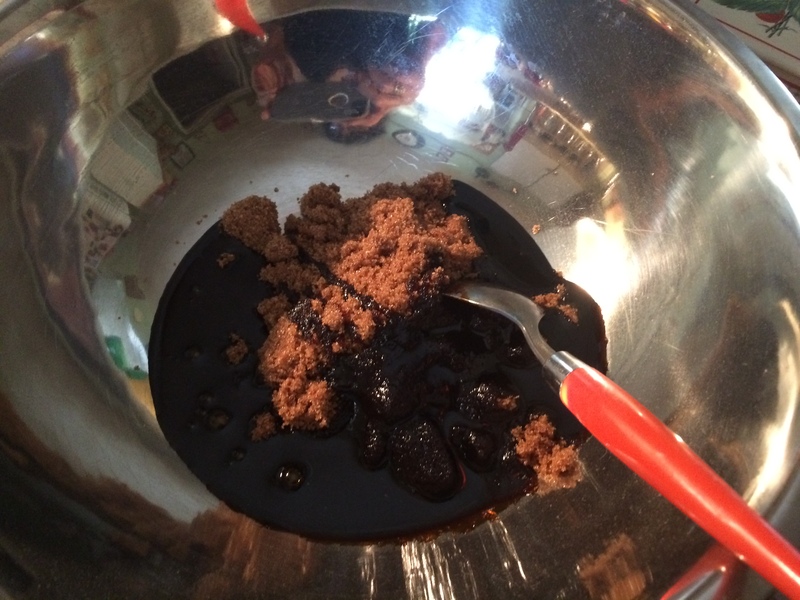 In a large bowl I mixed equal parts, 1 cup of each brown sugar and molasses. 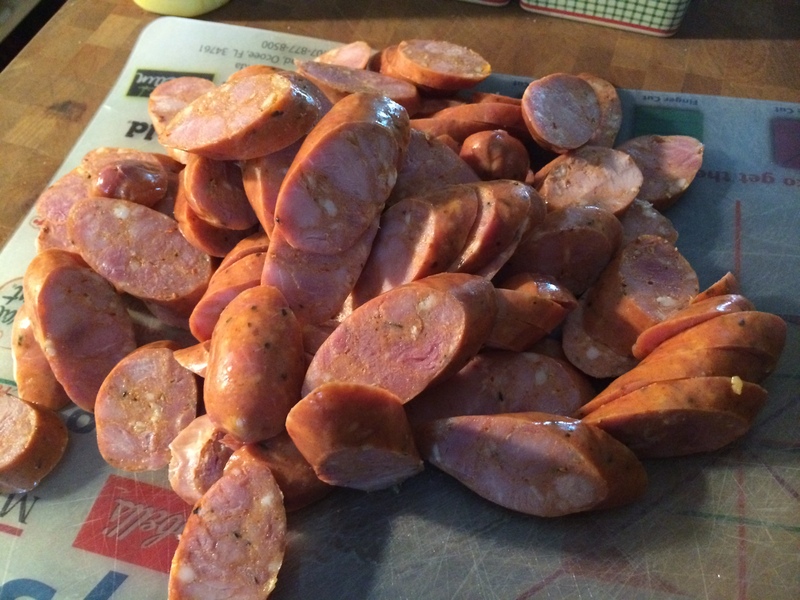 I purchased 2 packages of Andouille which yielded 10 links. I mixed this together in the bowl. 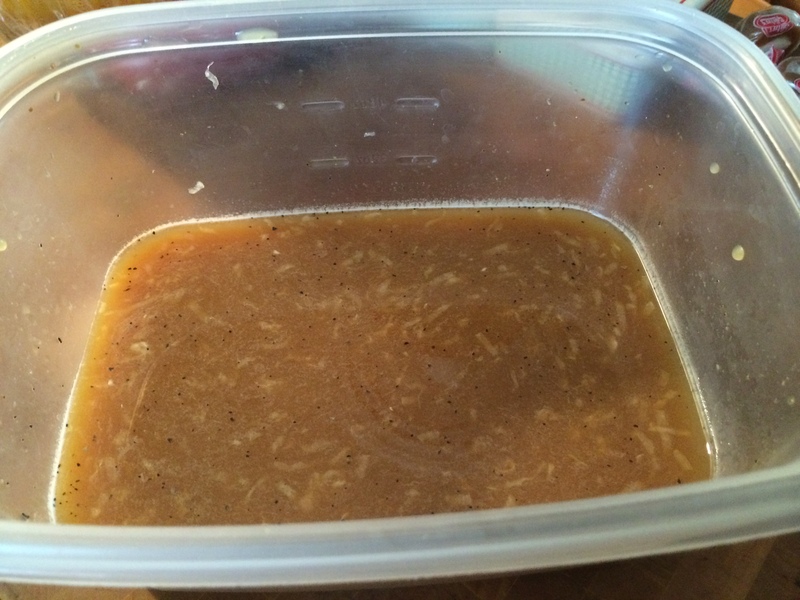 I found that after mixing the two I needed to add 1-2 tablespoons of water just to loosen it up a little. This is what it should look like. At this point I sliced all the sausage links on the bias before placing them into this mixture. 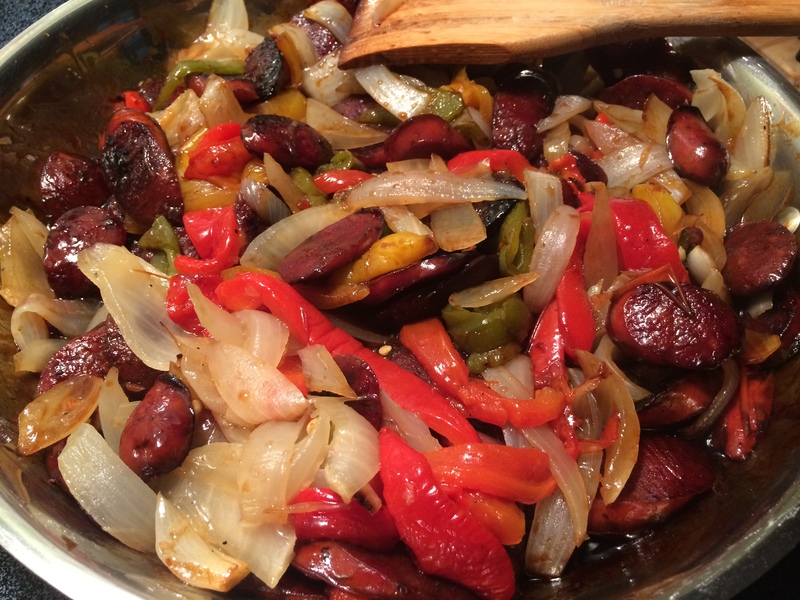 Toss the sausage really well through this marinate, then cover and refrigerate for a least 2 hours. Longer is even better. 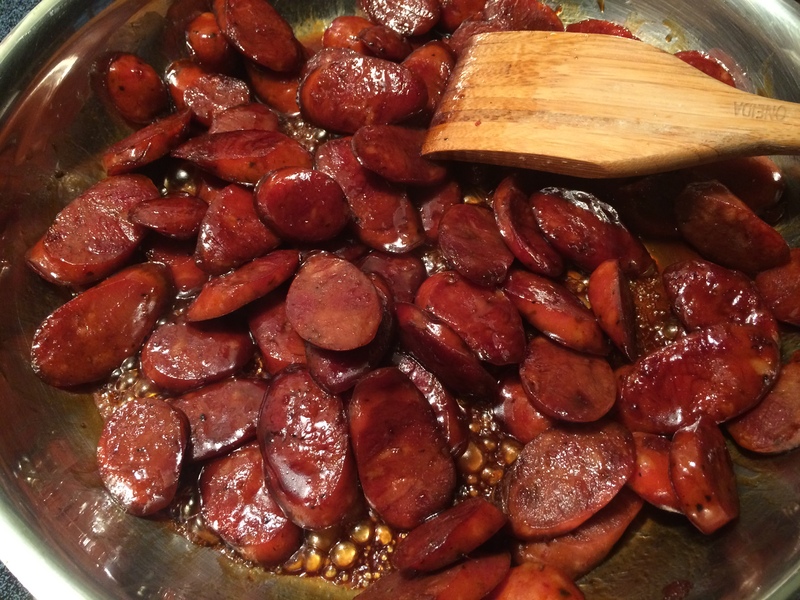 If you plan on making this recipe, marinate the sausage over night that’s just fine. So while this is marinating, I moved on to getting the veggies ready. There are not a lot of ingredients that go into this dish so what I learned was, you want to get the most flavor out of everything you add. I found that roasting does just that. 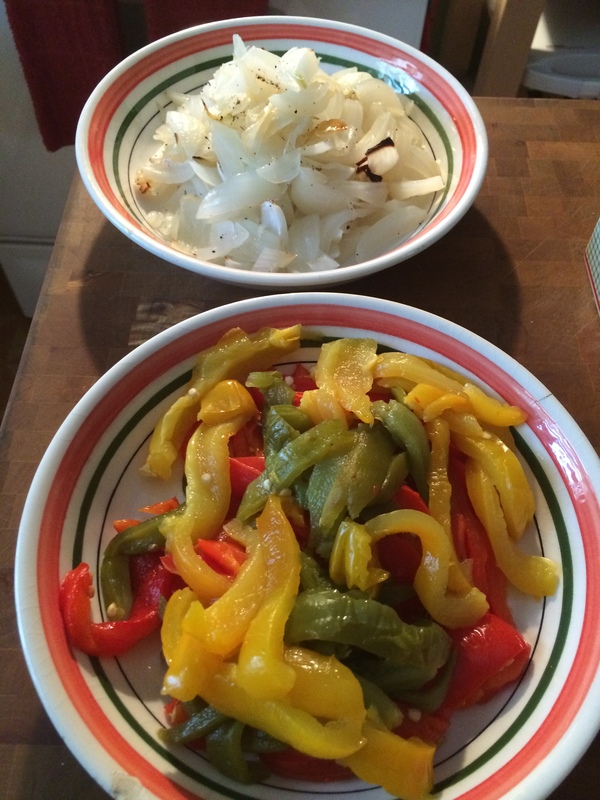 I have 2 large sweet onions and a variety of 4 bell peppers. I placed them on a baking sheet and roasted them off at 425 degrees for around 40 minutes, turning them so they would char on each side. I added a little olive oil, salt and pepper to the onions only. Here’s a great tip. When you open the oven to get this pan out stand back for just a second so you don’t get a pepper facial. 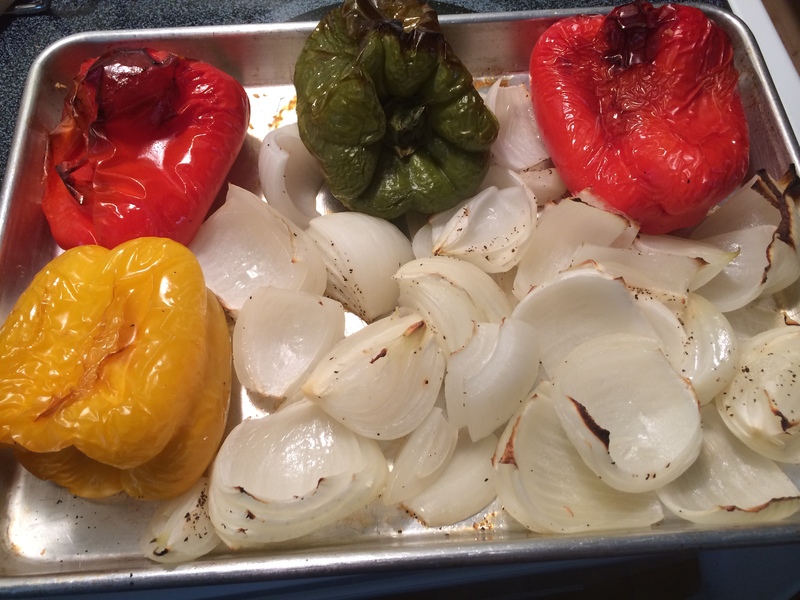 Let the onions sit on the baking sheet to cool but place the pepper in a large bowl covered with plastic. 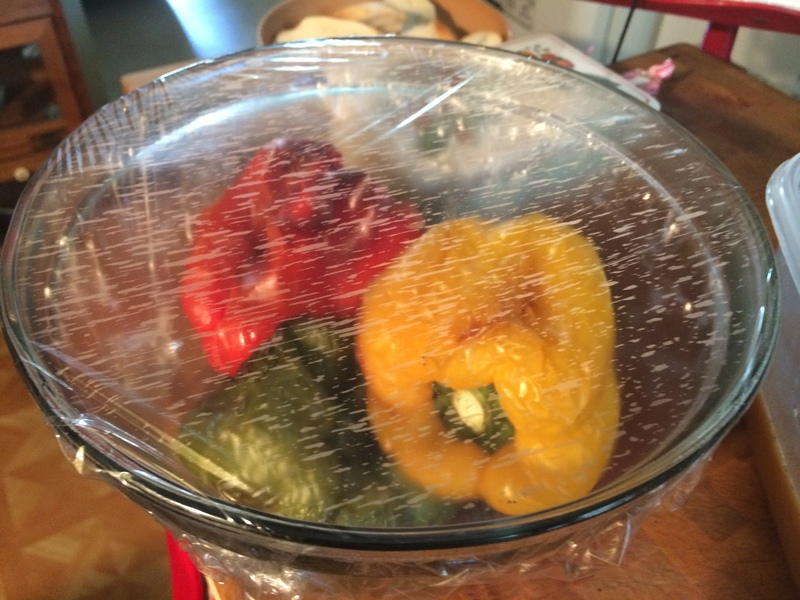 This will make it really easy to remove the skins off the peppers. So at this point i have the veggies doing their thing and the sausages doing their thing. I’m now going to get started on the marinate for the veggies. In a container I put around 12 ounces of orange juice, which is a small bottle. 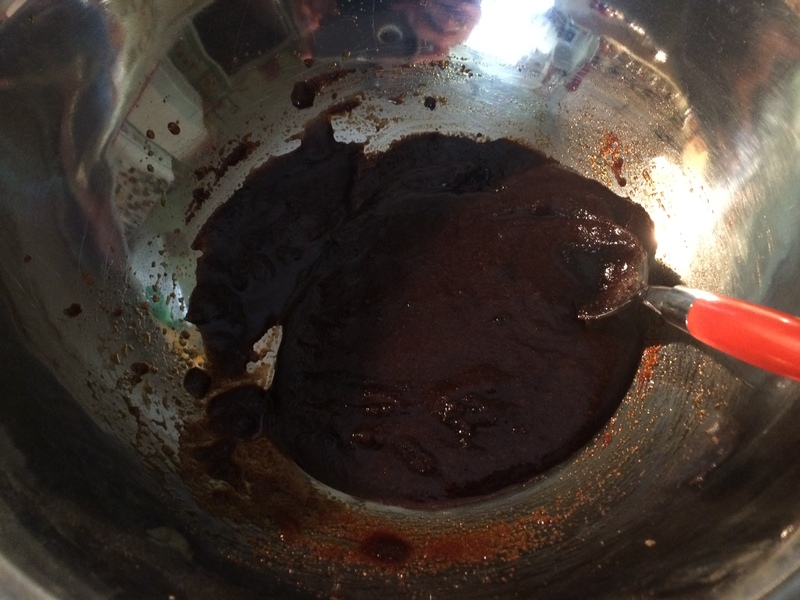 To that I added a 1/4 cup of low sodium soy sauce, and a 1/4 cup of packed light brown sugar. To this I added the juice of 2 limes. I grated 2 large cloves of garlic and added that to the mixture with a sprinkle of Kosher salt and pepper. I Whisked this all together and set it aside for just a minute while I removed the skins and seeds from the peppers. 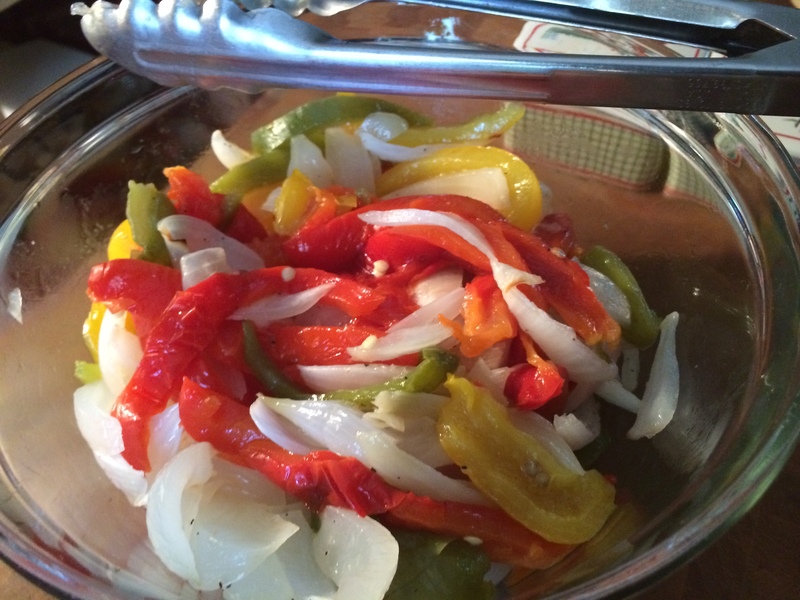 I sliced all the onions and peppers into thin strips and then added them to the citrus marinate. So now the final prep is the cheese. 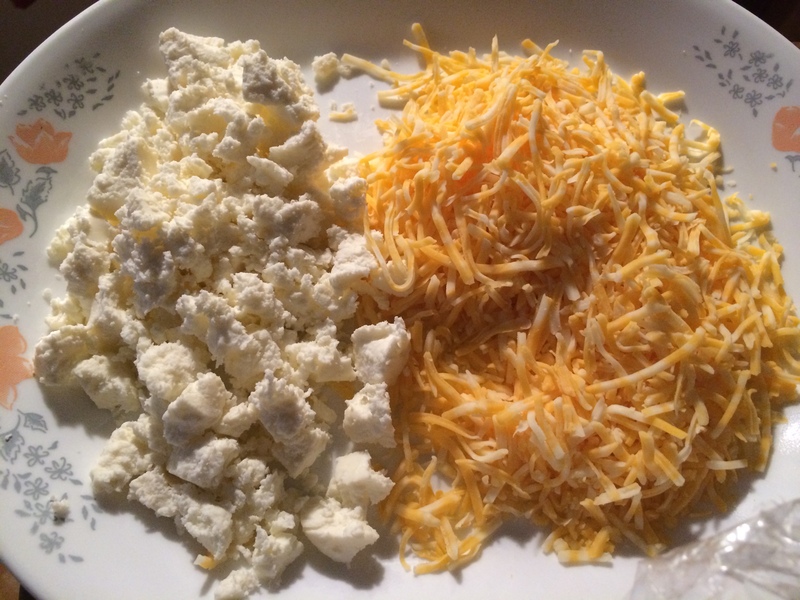 I grated around 2 cups of jack cheese and crumbled some Queso Fresco. 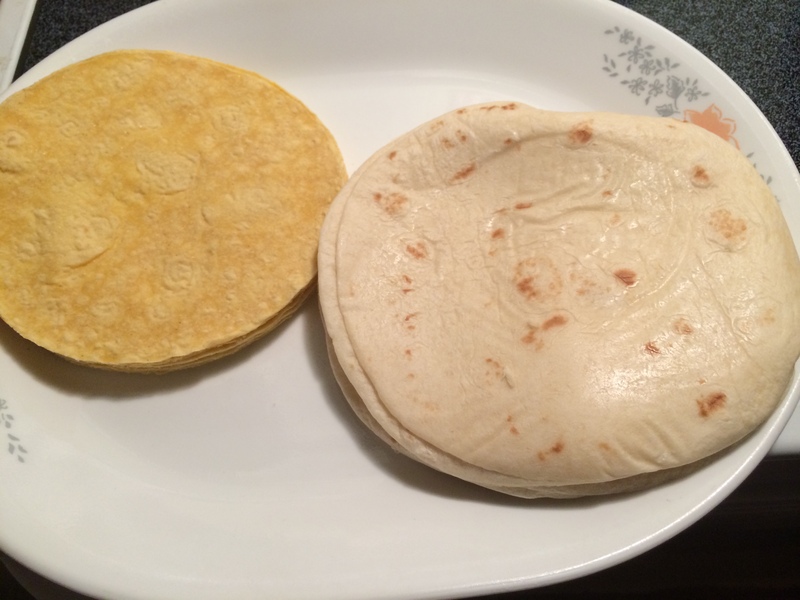 I decided to use both types of tortillas, corn and flour. I sprayed both sides of the corn tortillas with a little cooking spray and put them into the oven to get them nice and crisp. The flour tortillas I just placed into a dry pan to heat those through. Now I will say that you don’ want to start the tortillas until the sausage is done, so let me show you how I did that. I placed all the sausage into a large saute pan that had been heating over med high heat. 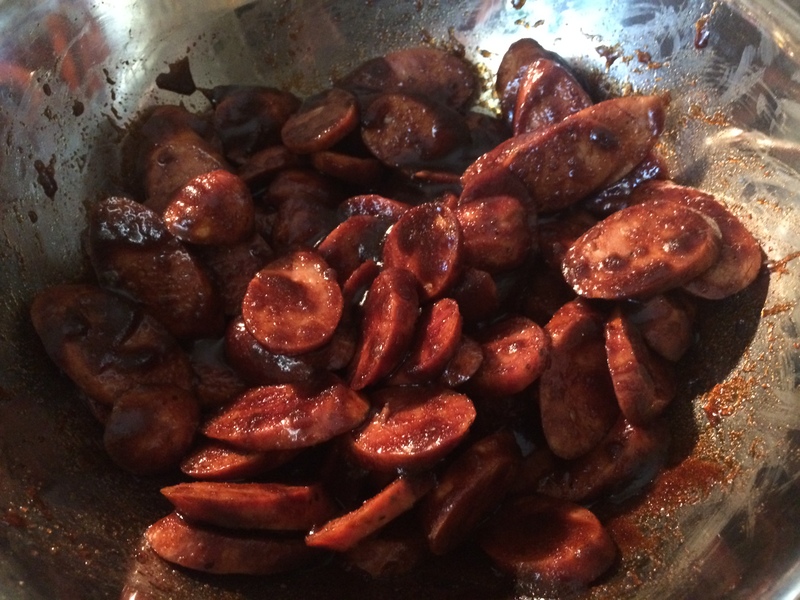 As you saute the sausage, juices will thicken and reduce nicely. 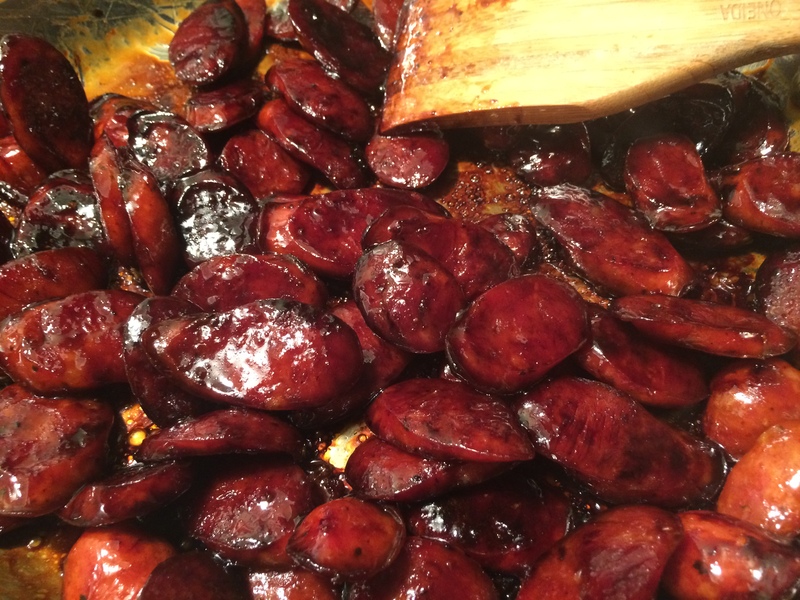 This may take around 20 minutes or so but keep turning the sausages so they all get nice and caramelized. While I saute the sausages on the top of the stove, I have the oven on 350 degrees and crisping up my corn tortillas in the oven. The flour I have on the back burner in a dry pan just warming those through. After the sausages are ready add the veggies and all their marinate to the pan. This will help in the deglazing of all the sugars as the citrus marinate hits the pan and releases all that’s stuck to the saute pan and bring up that extra flavor. Saute this together until the liquid reduces and thicken some more and then it’s ready. I would say another 5 minutes or just until all your tortillas are ready would be fine. Place some of this deliciousness onto your tortilla and top with cheese. YUM! The spicy sausage with the sweet coating, along with the citrus veggies. This is a roller coaster for you taste buds. I garnish with a kiss of very finely minced cilantro.